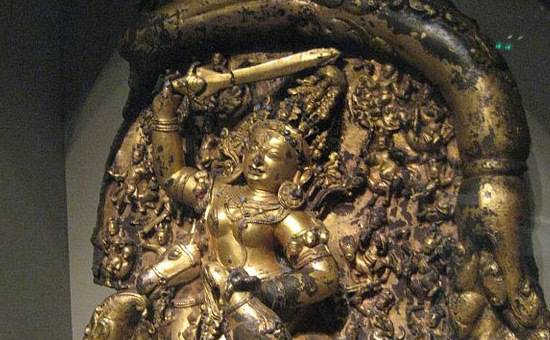 The attempt of this article is to collate as many Buddhist Goddesses as I could and Hindu Goddesses that are identical and show the reader how similar both systems are at the core, almost identical, with very marginal visual and name variations. I have always believed the differences in so called Hindu and Buddhist thought is complete semantics, There may be marginal variations as all schools of thought in Hinduism too have even within the faith. There is a trend of late by both sides to pull the two streams apart for mostly political or ego centric, reasons of exclusive identity. Hopefully this collation of goddesses would show the reader the similarities are far greater than the differences. The Primordial mother of all Buddhas. 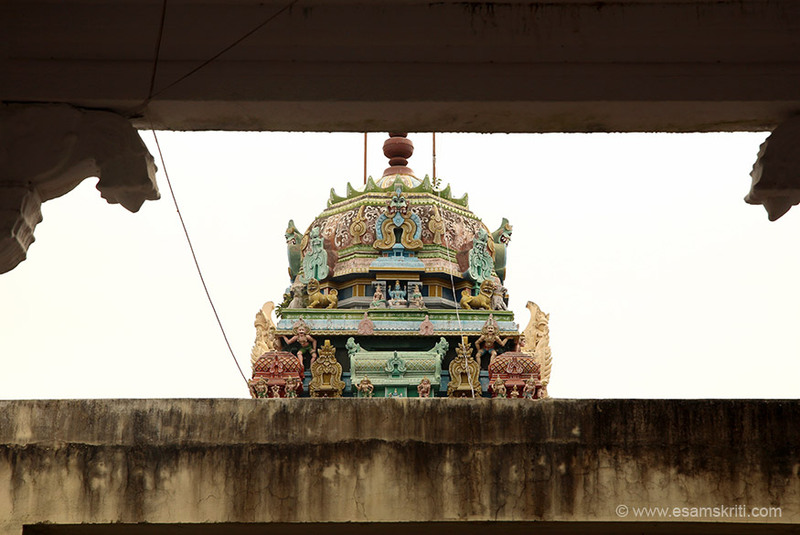 Samanta: Countless, infinity, end of space, being on all sides or all pervasive, countless. 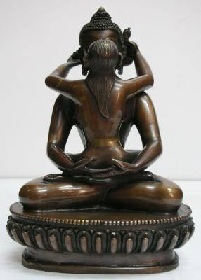 Guru and yidam - Primordial Mother of all the Buddhas is also considered an analogue of Prajaparamita. 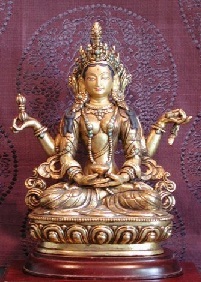 Samantabhadri is the consort and female counterpart of Samantabhadra / Kuntuzangpo, the primordial Buddha of the older schools of Tibetan Buddhism. 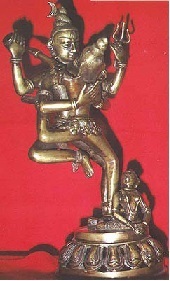 They are usually shown in sexual union (yab/yum in Tibetan), the blue male figure and white female figure embracing each other in lotus position. Samantabhadri is sometimes shown alone, in which case she is seated in lotus posture with her hands in meditation posture in her lap. Samantabhadri is always shown naked (as is her consort) to demonstrate the unadorned nature of Absolute Truth, the emptiness of all phenomena. She is in some senses an analogue of Prajnaparamita. A near equivalent of the New Translation schools is the dark-blue Vajradhatu-ishvari, shown in union with consort Vajradhara as the yab-yum Vajradhara / Vajradhatu-ishvari. All Hindus know that Shiva has a blue body, has a fair wife Durga, and a dark skinned wife Kali . 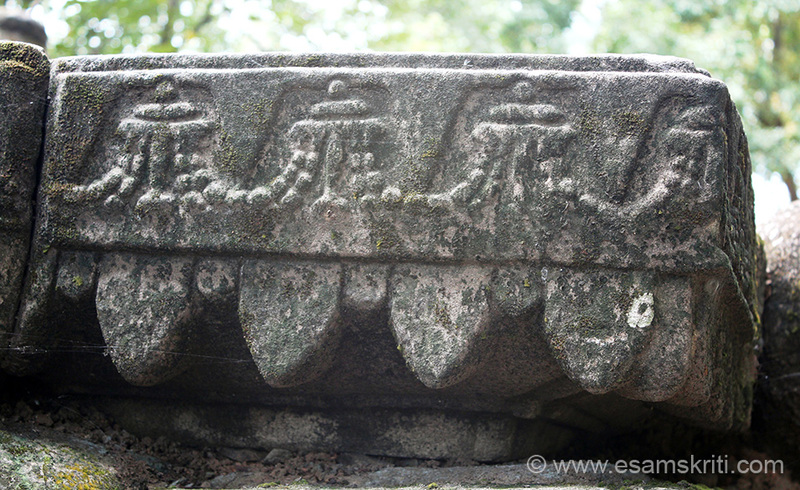 The symbolism is a shiva linga where the phalic symbol (shiva) is embedded in the yoni ( the circular stone around it, in an eternal sexual union. 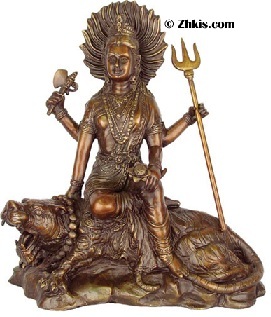 Hence you will see many later descriptions of Tara come close to Parwati , Shivas second wife who is an emanation of Sati who is Shivas first wife. Durga in Hinduism is the feminine force or Deity that manifests from the shunyatam or the ether of empty space from which everything arises. Parameter: Complete attainment, Trancendent Virtue, Perfection in. Guru and Yidam - Mother of all the Buddhas. Prajnaparamita embodies the bliss/emptiness that gives rise to all phenomena -- hence her honorific title as Mother of all the Buddhas. She usually appears as a tranquil seated figure clothed in silks; her body is gold in colour, and she has one face and four arms. Her name means 'Perfection of Wisdom'; in Tibetan she is also known as Yum Chenmo, or 'Great Mother'. She is closely associated with chöd practice. Embodies bliss and emptiness and gives rise to all phenomenon? This is the identical description of Durga Ma in Hinduism. Palden Lhamo (whose name translates as "Glorious Goddess") is the only female dharma protector common to all four schools of Tibetan Buddhism. She is very wrathful, and rides her mule through a sea of blood, surrounded by wisdom fire. She is dark blue and has one face with three eyes; she wears a sun at her navel and a moon at her crown, and over her is a peacock umbrella (a traditional symbol of protection). She is variously depicted, but her most common forms are two-armed and four-armed. There is also a system of divination by dice associated with her. She is sometimes considered cognate to Sarasvati or Tara, but is at the same time a wrathful emanation of the peaceful goddess Sri Devi. Please note the skulls on her crown and the slain human below. I don't have to translate this, I think all Hindus know who Sita is. Ekajata; One who is the bank of the river, One who is the protector , One who is the dancer. 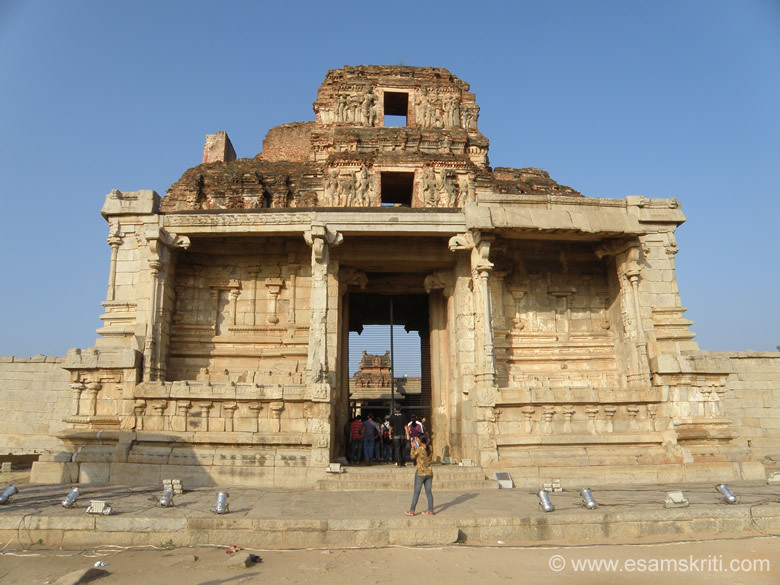 Kuru (Sanskrit: कुरु) was the name of an Indo-Aryan clan in Iron Age Vedic India, which started in the Early Vedic period and later evolved into a republican Mahajanapada state in the later Vedic period. The Kuru clan was located in the area of modern Haryana, Delhi and western parts of Uttar Pradesh (the region of Doab, till Prayag / Kaushambi) in North India. According to ancient texts, the territory of Kuru clan lay between the Rgvedic river Sarasvati and river Ganges and was split into two parts as Kuru-Jangala and Kuru Proper. As the goddess of learning and the arts, Sarasvati (also spelled Saraswati) is in many ways a counterpart to Manjushri, the male Bodhisattva of discriminating wisdom, and is sometimes his consort. Sarasvati is a peaceful yidam who holds a vina (a sitar-like lute) on her lap; she also sometimes holds a text. 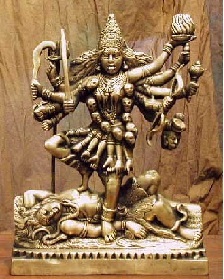 There is also a Hindu deity named Sarasvati with near-identical attributes. 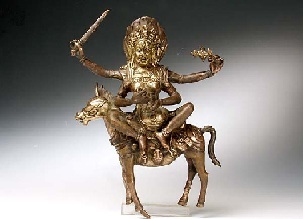 She is sometimes associated with Palden Lhamo, who may be regarded as Sarasvati in wrathful form. The most popular form of Sarasvati is white-coloured, with one face, two eyes, and two arms; however, there are many other forms including the white four-handed Sarasvati and the red Vajra Sarasvati.